I must have been around ten years old when I first became fascinated by the phenomenon known as telekinesis. For centuries, some people have claimed to possess the ability to move or alter objects using only their minds. (Oddly enough, bending spoons seems to be the most popular way to use one's telekinetic powers.) 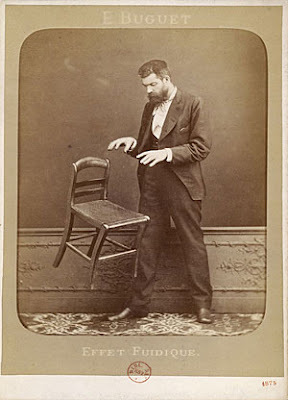 Unfortunately, most displays of telekinesis have been exposed as hoaxes. And I'm sad to report that, despite my best efforts, I've never been able to use my mind to levitate the rats that scamper about the subway tracks. But just the other day, I came across the video below. It shows an elderly Chinese man moving objects without touching them. Though the audio is not in English, I think the video is impressive enough without it. See if you agree. That was a coolio vid. I can understand it!! XD Ignore that... That guy would be a cool grandpa! OMG! another severed foot was found in Richmond, British Columbia!!! ITS MURDER I TELL YOU! Sorry, I think that he's just a skilled magician. I can read your mond your thinking of telekinesis. It's not the most acurate, but it's ok.
Wei so mo ta yao jiao? Why does he have to yell? That does look pretty cool, and fake, or not, it's still pretty cool. Lady Dahlia and Undiscovered Universe: I also want to fly! Have you read Maximum Ride by James Patterson? i want wings too. then i want to go steal fang from max. lolz. i love telekinesis, too, and as much as i want it to be true, i must ask two questions. one, why was there a long table cloth? and two, what was he doing to his stomache? irregular kiki: I LOVE MAX!!!!! Monster Quest Finally Found Something!